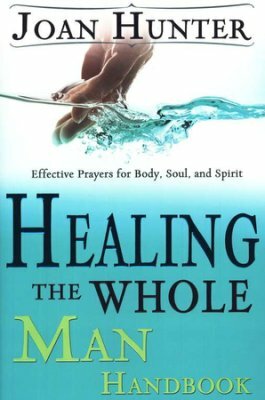 Healing The Whole Man Handbook by Joan Hunter- On Sale Now! You can walk in divine health and healing. The secrets to God’s words for healing and recovery are in this comprehensive, easy-to-follow guidebook containing powerful healing prayers. They cover everything from abuse to yeast infections and everything in between. Joan Hunter has over thirty years of experience praying for the sick and brokenhearted and seeing them healed and set free. By following these step-by-step instructions and claiming God’s promises. You can be healed, set free, and made totally whole—body, soul, and spirit! Joan Hunter is a compassionate minister, dynamic teacher, accomplished author, and anointed healing evangelist who has devoted her life to carry a message of hope, deliverance, and healing to the nations. As founder and president of Joan Hunter Ministries, Hearts 4 Him, 4 Corners Foundation, and 4 Corners World Outreach Center, Joan’s vision is to equip believers to take the power of God beyond the four walls of the church to the four corners of the earth. Joan ministers the gospel with manifestations of supernatural signs and wonders in healing schools, miracle services, conferences, churches, and revival centers around the world. She is sensitive to the move of the Spirit and speaks prophetically to the local body and into the individual lives of those in attendance. Joan’s genuine approach and candid delivery enable her to connect intimately with people from all educational, social, and cultural backgrounds. Joan Hunter brings a powerful ministry to a world characterized by brokenness and pain. Having emerged victorious through tragic circumstances, impossible obstacles, and immeasurable devastation, Joan is able to share a message of hope and restoration to the brokenhearted, deliverance and freedom to the bound, and healing and wholeness to the diseased. Joan’s life is one of uncompromising dedication to the gospel of Jesus Christ, as she exhibits a sincere desire to see the body of Christ live free, happy, and whole. At the tender age of twelve, Joan committed her life to Christ and began faithfully serving in ministry alongside her parents, Charles and Frances Hunter, as they traveled around the globe conducting Healing Explosions and Healing Schools. Prior to branching out into her own international healing ministry, Joan co-pastored a church for eighteen years. She has also been the featured guest on many television and radio shows, including Sid Roth’s It’s Supernatural!, It’s a New Day, The Miracle Channel, Steve Shultz’s Prophetic TV, and many others. Joan’s television appearances have been broadcast around the world on World Harvest Network, Inspiration Network, Daystar, Faith TV, Cornerstone TV, The Church Channel, Total Christian Television, Christian Television Network, Watchmen Broadcasting, and God TV. Joan and her husband, Kelley Murrell, live in Pinehurst, Texas. She has four grown daughters, her husband has four sons, and she is a blessed grandmother. Get your copy today! Your purchase today help support the ministry of the Christian Healing Center.